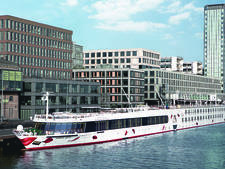 The 174-passenger A-ROSA Stella, built in 2005, offers one of the most inclusive river cruise experiences in European waters. 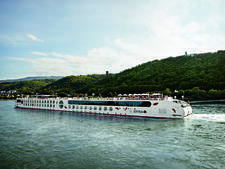 Among the features included in cruise fares are roundtrip air, gratuities, shore excursions and specialty beverages, including cocktails. 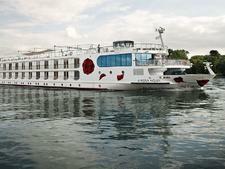 There are three decks of cabins on A-ROSA Stella. All are the same size, measuring 156 square feet. They have private bathrooms with showers, interactive televisions, writing tables and seating. The big difference is the location. The most economic can be found on Deck One, where cabins come in two configurations: one with beds that can be converted from queen to twin-sized, the other with a third berth, unusual in the river industry and perfect for small families. Both types have porthole windows. A-ROSA Stella's main restaurant is located on Deck Three, adjacent to the Lounge, where daytime enrichment and evening entertainment activities take place. The restaurant focuses primarily on Mediterranan-influenced cuisine with a continental European touch. Standouts on A-ROSA Stella are its massive spa, salon and gym. It's also got a steam room and a sauna with a vast picture window that offers great views. 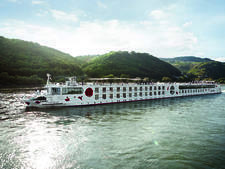 In keeping with its commitment to wellness and travel, Stella has a small pool on the sun deck, and bicycles are stocked for passenger use in port.